Gold Cup Preview: can the Irish spring one last surprise at Cheltenham? The Cheltenham Festival is nearly done and dusted for another year but the biggest race of all is still to come. We throw an eye over the cast for this afternoon’s Cheltenham Gold Cup. David Casey wins the Hennessy Gold Cup on Kempes last month. Latest Odds: 9/2 Imperial Commander, Long Run; 11/2 Denman; 6/1 Kauto Star; 8/1 Kempes; 11/1 Pandorama; 12/1 Midnight Chase; 18/1 Bar. Show me the man who says he can confidently predict the winner of this year’s Cheltenham showpiece and I’ll show you a complete chancer. This year’s race is unquestionably the hardest to call of the four features, which is saying something when you considering the standard of racing we’ve been privy to for the last three days. As champion, Imperial Commander is obviously the one that everyone will have to beat, though trend-watchers will most likely be scratching their heads at the pickle posed by his age. At ten-years-old, he is attempting to become only the second horse aged in double figures to win the race in the last 17 years, a stat which is by no means prohibitive but should give backers cause for slight concern. He has been very lightly raced this season, surfacing only to win the Grade 1 Betfair Chase at Haydock in November. That was all part of the plan, however, as he’s at his best when fresh. Of course, he’s not the only former champion in a field which is packed with illustrious company. Paul Nicholls’ duo of Kauto Star and Denman have been the two hottest properties in 3m chasing in recent years, winning this contest three times between them since 2007. If age is a black mark in Imperial Commander’s book, then it should also be for these two, both of whom are now eleven and won’t be racing for much longer. Denman ran on well to finish a distant third in the Hennessy in November, but he will need to improve on that performance to figure here. Similar sentiments apply to Kauto Star who was well below his best in the rescheduled King George in January. So who does that leave? The future of chasing is represented by Long Run, who placed second in last year’s RSA here and has already recorded a victory in the King George this season. The ground is a bit of a concern for him but, provided it doesn’t dry out to quicker than good-soft, he should have every chance. He looked every bit a great chaser back in January and I for one wouldn’t be too concerned about the presence of amateur jockey Sam Waley-Cohen on his back. While we’re talking about age, however, it is worth noting that no six-year-old has won this race since the great Mill House in 1963. The other principal British contender comes in the shape of Diamond Harry, winner of the Hennessy at Newbury in November. Those who are singing his praises on the basis that he trounced Denman by over 15 lengths would be well-advised to remember that he was carrying a whopping 26 pounds less than Nicholls’ horse, an advantage which he certainly will not have this afternoon. Though disappointing in last year’s RSA before pulling up, he does have course form having won two novice hurdles here ahead of the 2009 festival. The ground shouldn’t be a problem either. The two main contenders from Ireland come in the shape of Willie Mullins’ Kempes and Noel Meade’s Pandorama. Pandorama was very impressive in winning the Lexus at Leopardstown in December before injury ruled him out of a very competitive Irish Hennessy. It’s unlikely that the ground will suit his chances, however, as he much prefers a little bit more give in the ground. Kempes on the other hand won a 3m Grade 1 novice chase on good ground in Punchestown last April so he certainly has the form to take this one. He had every chance of stealing the Lexus when unseating AP McCoy two out in December, but bounced back with a magnificent four-and-a-half length win in the Irish Hennessy a month ago. With AP on board and Mullins in decent form this week, he has to be considered at odds of 10/1. TheScore says: The raiders haven’t disappointed in the features all week so we’ll go for Kempes to spring a surprise though Long Run and Imperial Commander will provide stiff opposition. Email “Gold Cup Preview: can the Irish spring one last surprise at Cheltenham?”. 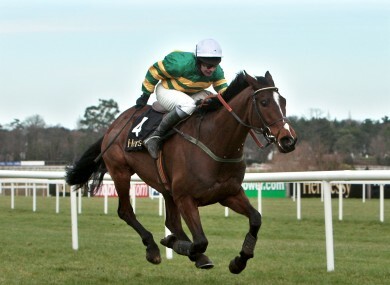 Feedback on “Gold Cup Preview: can the Irish spring one last surprise at Cheltenham?”.